A 4-day ‘History Festival’ promoting various historical collections, places and stories began at City Palace on Wednesday. 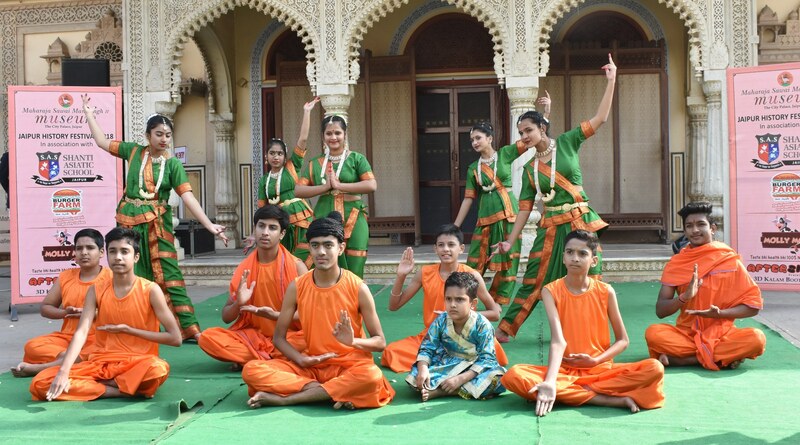 Organised by the Maharaja Sawai Man Singh II Museum, around 30 schools, 50 teachers and 650 students came together to celebrate history and showcase their talent in the form of dances, songs, live painting, plays, artwork, photography, travelogues and much more. The programme began with a prayer ‘Shabad’ by S.R.N International School. This was followed by a play on ‘Nazism’ by S.V. Public School and ‘Nationalism’ by Seedling school. This was followed by an energetic dance performance by D.P.S. Gurgaon who presented the ‘Four Seasons of Women’ in the Kathak dance form; ‘Gautam Buddha’ by St. Edmunds and ‘Meera’ by Subodh School Airport. The audience was mesmerised by the melodious musical performance by Shanti Asiatic School who presented a song called ‘6000 Years of Indus Civilisation’. Also on the occasion, Tagore International School presented a poem by Rabindranath Tagore. After this, the students of Shanti Asiatic School and Tagore International School performed a skit of Mahabharat to relate to the virtues and vices of the demons we fight within. Other highlights of the event included – Book launch of ‘Khichdi’ by S.V. Public School Cauldron Sister; Stories of the Kings by the Palace School; documentary film screenings by INTACH; an art gallery featuring photos of ‘Jaipur Then and Now’ as well as a ‘3D Kalam’ workshop where students made seals and catapults by AFTERSKOOL. A ‘Live Exhibition’ showcased the concerted efforts of all the participating schools. On display were – paintings, historical texts, live painting of eminent historical figures, 3D models, Revolution and Travelogue – RTM-E models, blue pottery tiles, travelogues of renowned historical figures and much more. Students of NIMS International School also presented Audio books on History targeted for NCERT Social Studies subject.